In a large bowl combine the fish, potatoes and milk and seasoning. Divide the mixture into 12 -15 portions. Dust hands well with flour and shape into globes. Mix together the breadcrumbs and parsley. 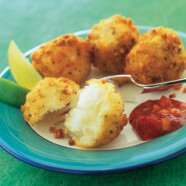 Coat the fish globes in egg and then the breadcrumb mixture. Chill the fish globes in the fridge for about 30 minutes. Heat the oil in a deep frying pan and fry the fish for 6-8 minutes or until golden brown.